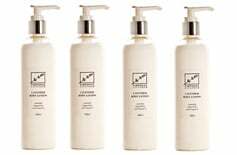 A nourishing yet silky body lotion, ideal for all skin types, particularly dry skin. With a unique and luxurious blend of replenishing fruit and nut oils to deeply hydrate your skin. The vibrant floral - citrus perfume of bergamot essential oil blends beautifully with the fresh, soothing perfume of lavender essential oil.